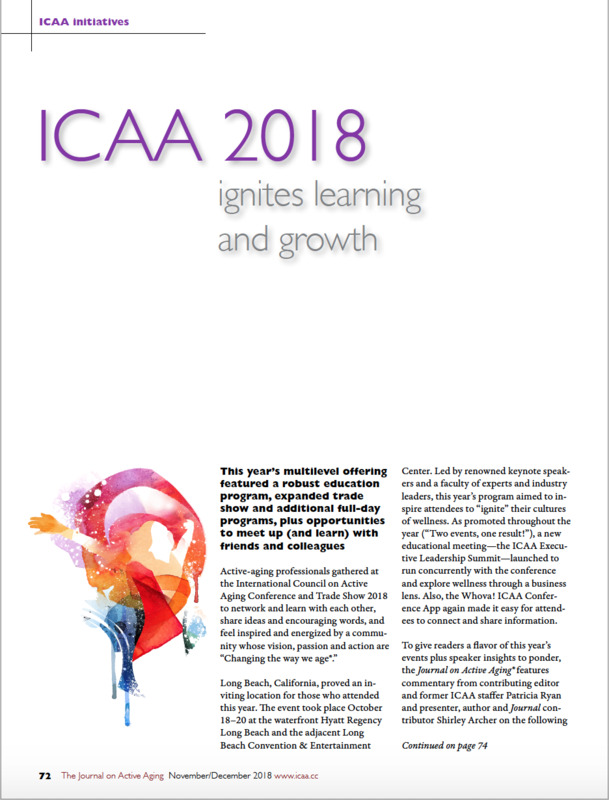 Active-aging professionals gathered at the International Council on Active Aging Conference and Trade Show 2018 to network and learn with each other, share ideas and encouraging words, and feel inspired and energized by a community whose vision, passion and action are "Changing the way we age." Long Beach, California, proved an inviting location for those who attended this year. The event took place October 18-20 at the waterfront Hyatt Regency Long Beach and the adjacent Long Beach Convention & Entertainment Center. Led by renowned keynote speakers and a faculty of experts and industry leaders, this year's program aimed to inspire attendees to "ignite" their cultures of wellness. Every fall, spring and summer thousands of college and high school students will look for an internship or service-learning experience. Students seek real-world experience, understanding of different career choices, practicum hours and letters of recommendation to get into college or graduate school, potential jobs, or opportunities to complete service projects for classes. These activities fall under the concept of experiential education, or learning through experience outside of the classroom. Through internships and service-learning programs, students hope to integrate knowledge and skills gained through academic training and apply them to a real-life situation. Organizations that work with these programs experience positive outcomes as well as mutually beneficial rewards. Located in the affluent coastal community of Montecito, California, Casa Dorinda has provided luxury retirement living for more than 40 years. 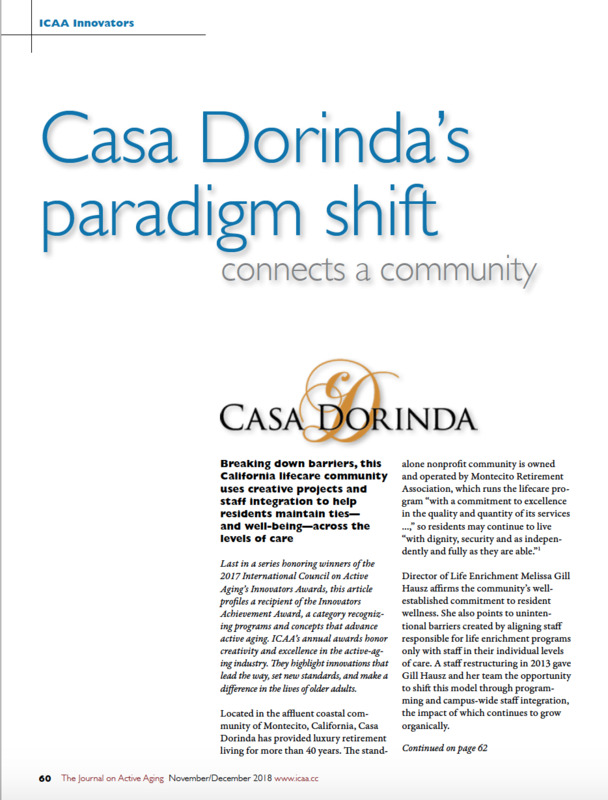 The stand-alone nonprofit community is owned and operated by Montecito Retirement Association, which runs the lifecare program "with a commitment to excellence in the quality and quantity of its services ...," so residents may continue to live "with dignity, security and as independently and fully as they are able." Director of Life Enrichment Melissa Gill Hausz affirms the community's well-established commitment to resident wellness. She also points to unintentional barriers created by aligning staff responsible for life enrichment programs only with staff in their individual levels of care. A staff restructuring in 2013 gave Gill Hausz and her team the opportunity to shift this model through programming and campus-wide staff integration, the impact of which continues to grow organically. The Journal on Active Aging recently asked Gill Hausz to share her insights and experiences, as well as the impact of her community's efforts. As we sat together and talked about changes Barbara wanted to make in her life, I noticed her eyes start to fill with tears. Our conversation was typical of so many I have experienced over the past 25 years with guests at the Canyon Ranch wellness resort in Tucson, Arizona. Barbara, soon to celebrate her 70th birthday, had been enjoying an active retirement .... Her goals for the week were typical: begin a regular exercise routine, lose a little weight, improve her sleep, cut back on alcohol, start meditating, and stop worrying so much about her grandkids. She had a few hurdles as well. Barbara had recent knee surgery, nagging back pain, and high blood pressure for which her doctor had just prescribed medication. So, what brought on the tears? After reviewing her goals and scheduling a personal-training session and nutrition consultation, Barbara turned to me and said, "Look, I know what I should be doing, but I'm just not doing it! What's wrong with me? Why can't I get my act together?" And, so began Barbara's journey of understanding what gets in the way of living her best life. This article invites readers to join Barbara's journey. We'll review insights and practices that better equip us to support our clients--and ourselves--in launching and living our best lives, at any age. "Sunnyside Communities has a history of supportive retirement living that began more than 100 years ago," states Annie Shaffer, wellness director at Sunnyside Retirement Community in Harrisonburg, Virginia. The Sunnyside campus is one of three life-plan communities--King's Grant and Summit Square being the others--owned and operated by the faith-based nonprofit. It is also a community whose active-aging efforts have won recognition from the International Council on Active Aging. In fact, the Sunnyside community has garnered more ICAA Innovators Awards for its initiatives than any other organization since the awards program launched--all during Shaffer's tenure. 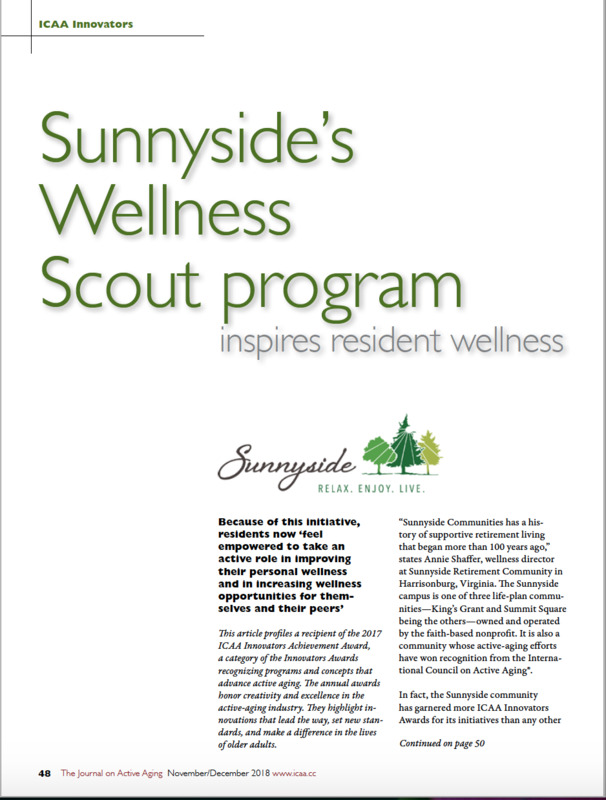 Honoring Sunnyside's recent efforts, ICAA granted a 2017 ICAA Innovators Achievement Award to the community's Wellness Scout program. 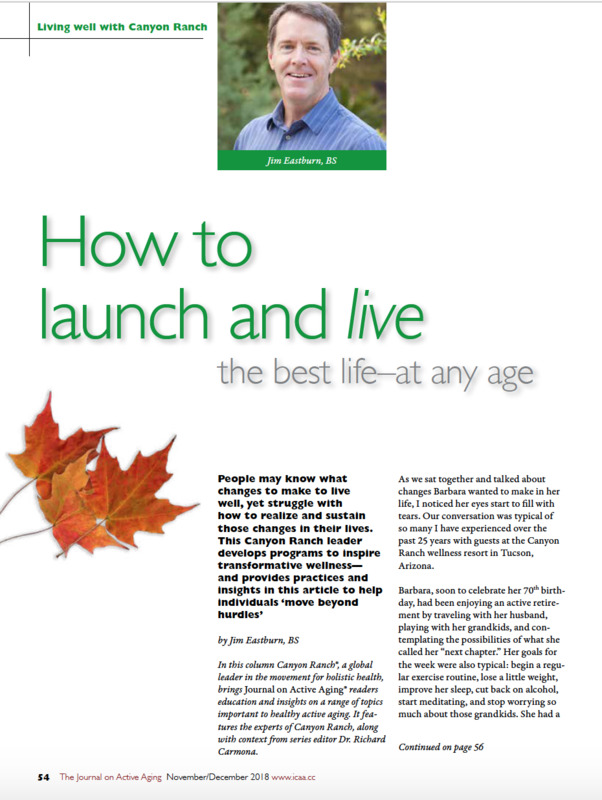 To find out more about the program, the Journal on Active Aging recently talked to Shaffer. I'm a happy person. An ex-boyfriend once told me, "You're happy because you don't have any problems." I told him, "You're unhappy because you don't know what a real problem is." That relationship didn't work out. But our conversation illustrates typical perceptions. Many people think happiness is something that comes to them, rather than something to create for themselves. 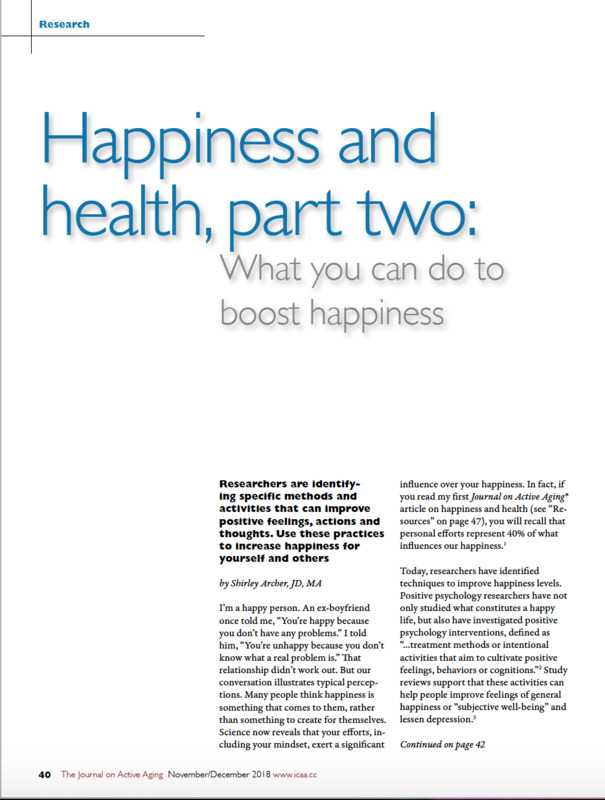 Science now reveals that your efforts, including your mindset, exert a significant influence over your happiness. Researchers have broken down three distinct paths to happiness: positive emotions and pleasure, engagement, and meaning. Practices that boost happiness, therefore, increase experiencing and savoring pleasures, losing the self in engaging activities and participating in meaningful activities. Diabetes has plagued us for centuries. Today, however, we are experiencing a diabetes epidemic. ... 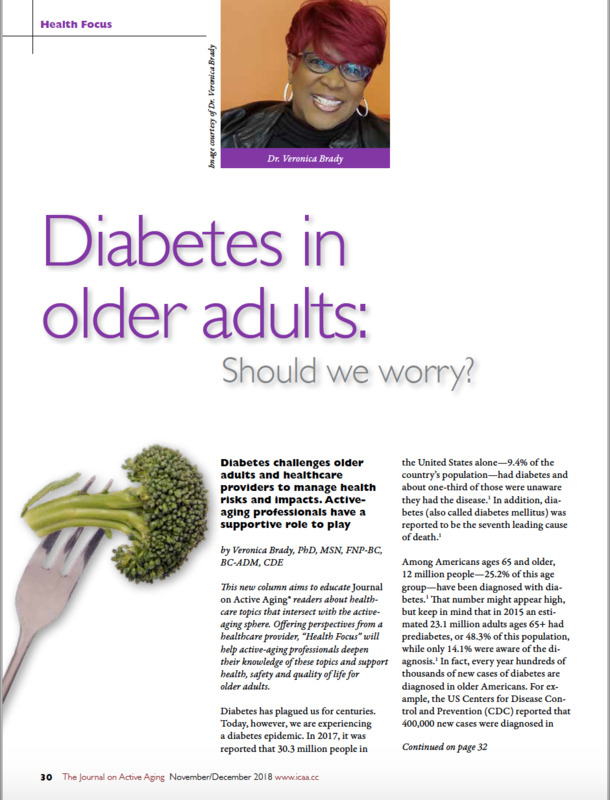 Among Americans ages 65 and older, 12 million people--25.2% of this age group--have been diagnosed with diabetes. That number might appear high, but keep in mind that in 2015 an estimated 23.1 million adults ages 65+ had prediabetes, or 48.3% of this population, while only 14.1% were aware of the diagnosis. In fact, every year hundreds of thousands of new cases of diabetes are diagnosed in older Americans. And the risk of diabetes rises as we age. Despite frequent announcements of new offerings, it's difficult at times to come up with meaningful technologies targeting older-adult wellness to showcase in this column. 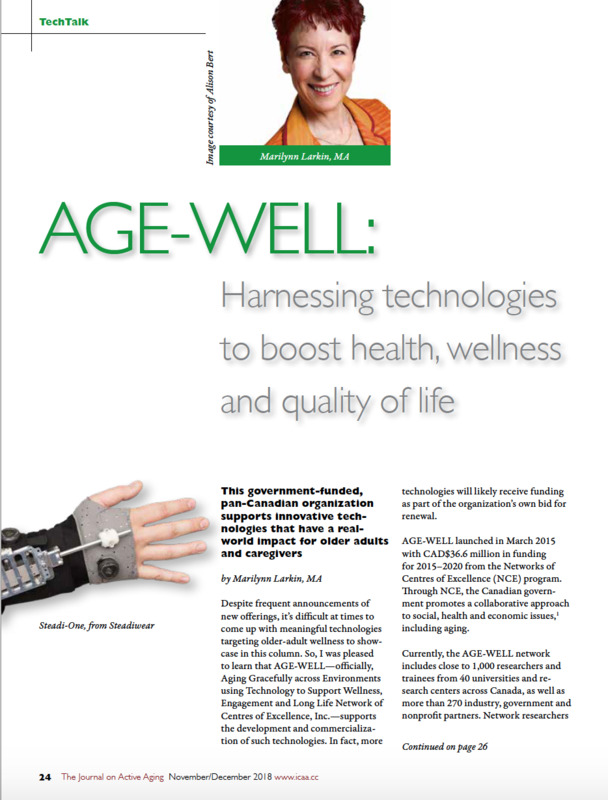 So, I was pleased to learn that AGE-WELL--officially, Aging Gracefully across Environments using Technology to Support Wellness, Engagement and Long Life Network of Centres of Excellence, Inc.--supports the development and commercialization of such technologies. AGE-WELL launched in March 2015 with CAD$36.6 million in funding for 2015-2020 from the Networks of Centres of Excellence (NCE) program. Through NCE, the Canadian government promotes a collaborative approach to social, health and economic issues, including aging. 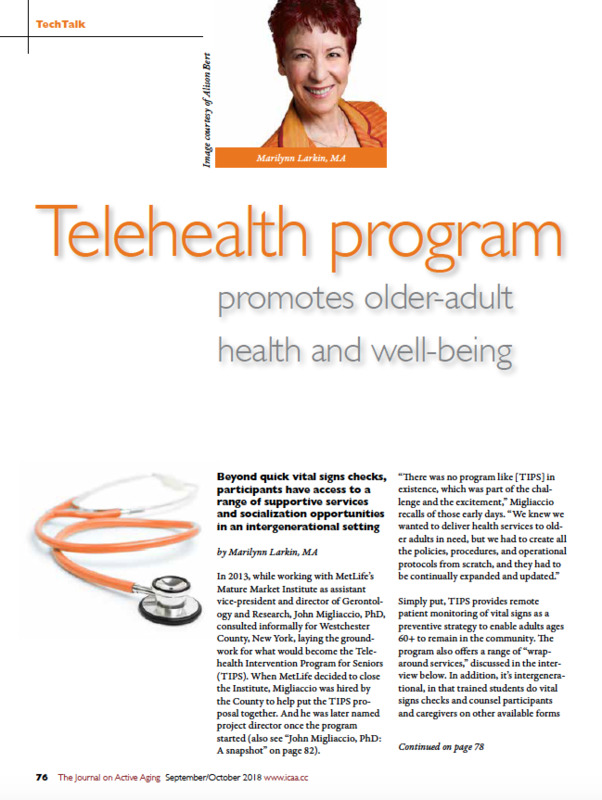 In 2013, while working with MetLife's Mature Market Institute as assistant vice-president and director of Gerontology and Research, John Migliaccio, PhD, consulted informally for Westchester County, New York, laying the groundwork for what would become the Telehealth Intervention Program for Seniors (TIPS). When MetLife decided to close the Institute, Migliaccio was hired by the County to help put the TIPS proposal together. And he was later named project director once the program started. "There was no program like [TIPS] in existence, which was part of the challenge and the excitement," Migliaccio recalls of those early days. "We knew we wanted to deliver health services to older adults in need, but we had to create all the policies, procedures, and operational protocols from scratch, and they had to be continually expanded and updated." Simply put, TIPS provides remote patient monitoring of vital signs as a preventive strategy to enable adults ages 60+ to remain in the community. The program also offers a range of "wraparound services" .... The Journal on Active Aging recently talked to Migliaccio to learn more about TIPS, the benefits to participants, and the outcomes achieved.